Eternity rings have become a very popular choice with women today. Whether it is the engagement ring or the wedding ring, eternity rings have become a preference with the ladies. Also known as the infinity ring, this ring is like a band made of precious metal like gold, platinum, white gold, rose gold etc and has a continuous line of some precious stone studded. Diamonds are a great choice in this regard and symmetrically cut diamonds are mainly used. 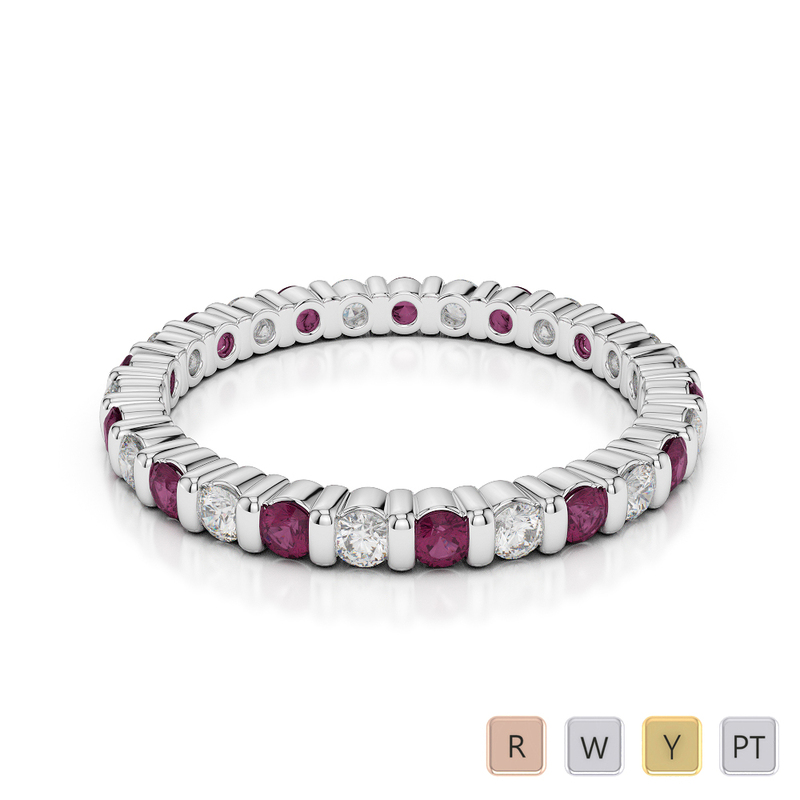 However, along with diamonds, ruby eternity rings are also gaining great popularity with women. The combination of ruby and diamond is lethal. Ruby, the red colored gemstone symbolizes romance, passion and depth. 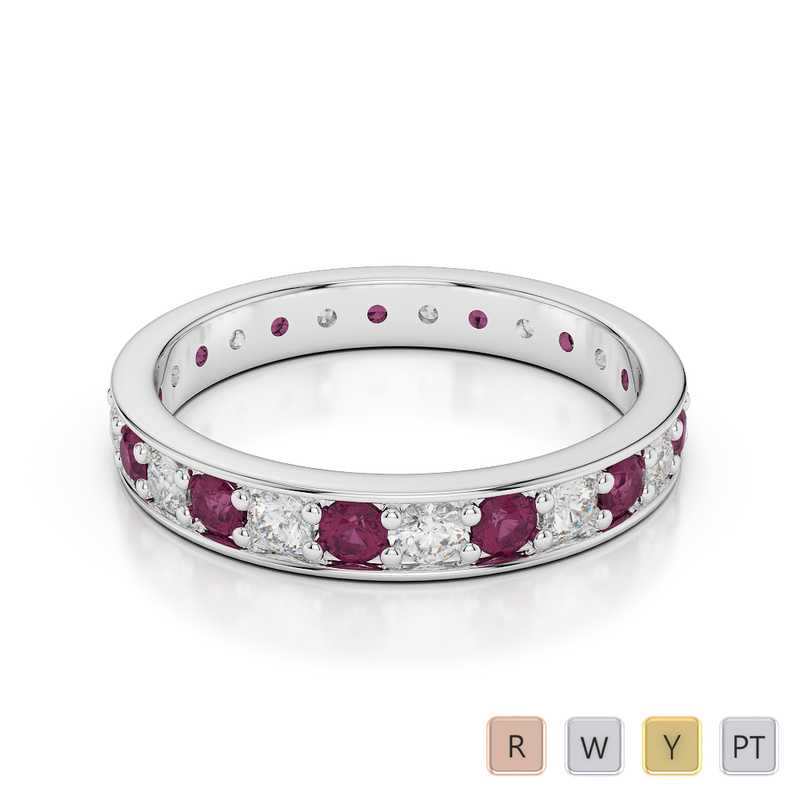 So when eternity rings symbolize eternal love, ruby adds more passion to that. 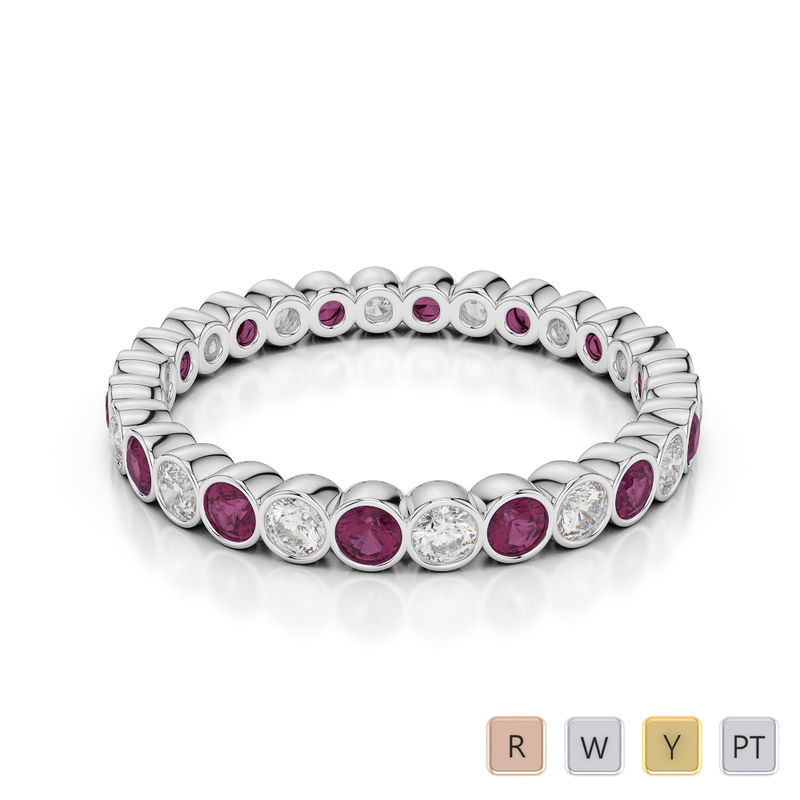 The ruby eternity ring becomes a symbol of immortality and everlasting love and passion. 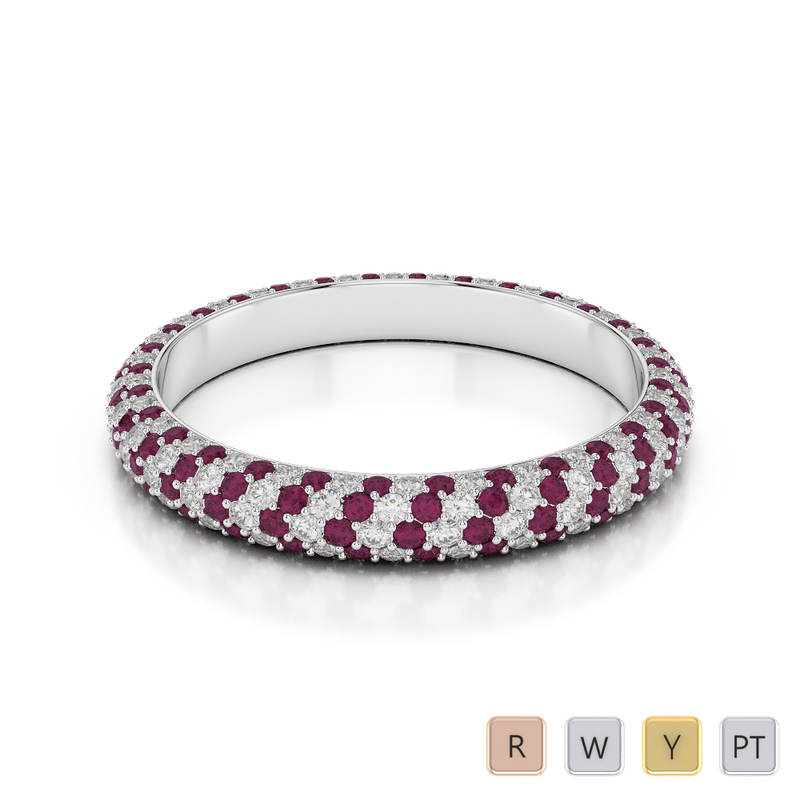 With perfect settings of diamonds and rubies in an eternity ring, it becomes a unique piece of art. This lovely looking eternity ring has white gold as the base metal. With 9 karat white gold, the ring has a perfect finish. The width of the ring is such that it fits snugly on the finger without any kinds of edges etc. Coming to the settings of the diamonds and rubies, the ring has the precious stones cut immaculately for perfect setting in the ring. The diamonds have weight of 0.38 carat and are cut brilliantly in round shape. The setting type is ‘prong’. The clarity and color of the diamonds is first class. The red rubies, weighing 0.50 carat, are also brilliantly cut and set alternatively to the diamonds. If you are ready to shell off more money for the eternity ring, you can choose this heavily studded diamond and ruby eternity ring. Set closely in micro pave style, this ring is a stunner for sure. When taking a look from the side, the diamond and ruby settings are in ‘V’ shape and look lovely. This ring also has 9 karat white gold as the base metal. The diamond is 0.60 carat and ruby is 0.80 carat. The stones are in perfectly round shape and cut brilliantly. If you are looking for a bezel style setting for your diamond ring and ruby eternity ring, this ring will be just perfect for you. This ring is designed in a unique manner and gives a very classy and elegant feel. The diamond and the ruby is cut in brilliant round shapes and set perfectly. The diamond weighs 0.40 carat, while the ruby weighs 0.53 carat. The quality and clarity of both the stones is good. Preferably white gold goes best with this combination. If the woman in your life is a person who likes things to be simple and fuss-free, this ring is going to be a perfect choice for her. This simplistic design of the eternity ring is splendid. With bezel setting type, the ring does not have many intricacies. With 0.38 carat brilliantly cut diamonds and 0.53 carat round rubies, this ring can be worn as daily wear for its fuss-free appeal. The 9 karat white gold base also makes the ring attractive and classy. 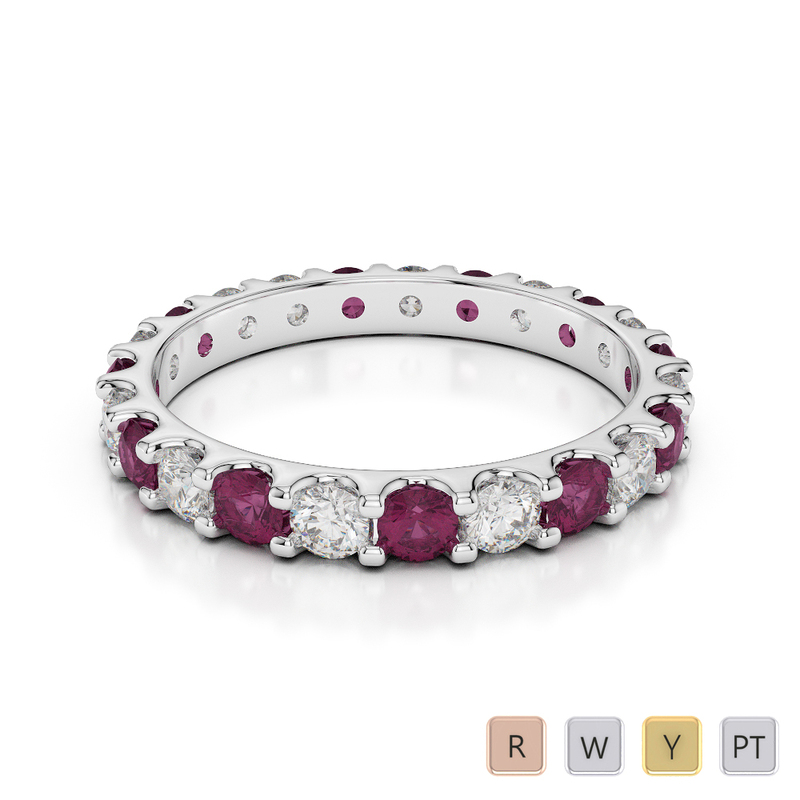 If budget is no constraint for you, this exclusive ruby eternity ring will surely sweep your lady love off her feet. The rubies and diamonds used in the ring are quite large. Set in prong style, the diamonds in the ring weigh 0.67 carat, while the rubies weight 0.76 carat. Set alternatively on white gold or platinum base, this ring clearly shows off opulence. Check out the items and book the one you find best.